The man before me was like any other - middle-aged, graying hair, a little thick around the middle. There was a tiredness about him from a day of searching for what he prayed not to find - someone's loved one, buried under mounds of rubble or floating in a creek. "I drove in from Montana. I just had to help. Figured I'd sleep in my car, but I'd sure appreciate a shower if you know of a place I can clean up." He was not alone. Hundreds of people have arrived in Joplin, touched by the destruction that an EF5 tornado had brought to this town, and offering to play a small part in helping total strangers rebuild their lives. A nurse called the day after the tornado struck and was told they no longer needed medical personnel. She drove down anyway and once in Joplin was asked to set up and run a small clinic in one of the shelters. When her patients were attended to, she was joined by her daughter from Texas and teamed with others who were spending long hours combing sections of the town in search of survivors. "My father lost his home so I drove in from central Nebraska to help," a gentleman said. "I have 15 people joining me this weekend. What can we do?" Arayo and I met a Newfoundland friend and spent the day in Joplin. I hoped to track down an old buddy I'd been unable to reach to insure his safety, then we planned to take the Newfs to offer a little dog therapy to victims and responders. Spotting the volunteer registration center, we asked how else we could help and were assigned to the front desk where we registered new volunteers, visited with search and rescue crews returning from the rubble, and directed others to showers and shelter. As we heard story after story, I was truly touched by the outpouring of love and care which was expressed. 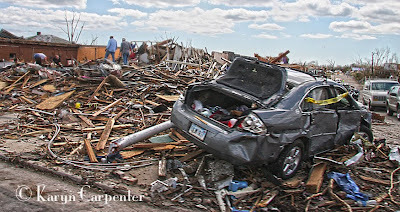 I was amazed at the willingness of people to leave their lives behind and to drive into a disaster area to help others with whom they had no connection. The uncertainty of "Where will I eat? Where will I sleep? What will I be asked to endure?" paled as they focused on the bigger question, "How can I make a difference?" The flood of compassion is astounding. Housewives, military men, bankers, fugitives, teachers, blue collar workers, families with children, teens with tattoos, bikers and clergy; all work side by side. The common need meets uncommon compassion. At the end of the day, the outer trappings are peeled away and each knows that where it matters, they are all the same. They've experienced the good in each other. As the world's eyes and ears turn to the horrors and destruction wrought on Joplin last Sunday, we can choose to look at the atrocity or we can join together in a common goal of support and regrowth. Sometimes I just stand in awe of the good in our fellow man. Great post Karyn! Thank you. What an amazing experience for you and Arayo, and Donna. It is so wonderful how people come together in times of disaster - driving across that vast country to help strangers shows the true spirit of America. You know I cried at this, but it is also encouraging to know that the good comes out when our fellow human beings are suffering. Thank you Karyn - although it makes me reflect on such a difficult time for all of us that live in Joplin. The people that have come to help and are still coming have been so awesome - we will never forget their acts of kindness. Appreciate your insight and post.